Nicolas Poussin (1594–1665) The Empire of Flora (detail) (1631), oil on canvas, 131 × 181 cm, Gemäldegalerie Alte Meister, Desden, Germany. Wikimedia Commons. Ovid closed Book 12 of his Metamorphoses with the death of the great Greek warrior Achilles. As was customary, his arms and armour were then to be passed on to a successor. As they had been made specially for him by the god Vulcan (Hephaestus), they were particularly sought-after. Two contenders emerged, Ajax the Great and Ulysses. Agamemnon therefore summoned the leading Greek warriors to determine who was to be given Achilles’ unique arms and armour. Ovid uses the speeches of Ajax and Ulysses as a means of quickly summarising some of the action which had taken place in the war against Troy up to this moment. Ajax puts his case first. He claims that, when Hector tried to set fire to the Greek fleet, it was he who stayed to fight the Trojans. He mentions that Ulysses was late joining the combat, as he had feigned madness, but he had been there from the start. When his colleague Philoctetes was dying, Ulysses had abandoned him to die alone. Ajax had even had to save Ulysses on the battlefield, and finally he says that he needed a new shield as his current one was worn out with fighting – but Ulysses’ shield had barely been used. Ajax concludes by proposing that the two should settle the matter in a fight, in which he feels Ulysses would stand no chance. This elicits applause from the crowd of warriors around them. Ulysses doesn’t play to that gallery, but when he steps up, he delivers an eloquent argument to the leaders, who are to make the decision. He says that he found Achilles hiding on the island of Scyros, and brought him to the war, so can claim Achilles’ successes as his. It was he who convinced Agamemnon to sacrifice Iphigenia in the first place, and enable the thousand ships of the Greek fleet to sail on Troy. He had worked hard at diplomatic solutions during the first nine years of the war, when Ajax had done nothing. He had also convinced both Agamemnon and Ajax not to abandon the war. Ulysses had killed a Trojan spy, Dolon, and had been wounded in battle, unlike Ajax. He also denies Ajax’s claim to have saved the fleet from fire, arguing that it had been Patroclus in disguise. Ulysses had later carried Achilles’ dead body from the battlefield, and will recover that of Philoctetes. To emphasise that, in Ovid’s world of Metamorphoses at least, it is words which carry greater weight than deeds, Achilles’ armour is awarded to Ulysses. the fated sword and plunged it deeply in. which grew of old from Hyacinthine blood. the warrior’s name, Apollo’s cry of woe. The warrior literally falls on his sword, and like Hyacinthus before, his blood is turned into the purple hyacinth flower, its leaves marked with the letters AI, which are the start of Ajax’s name and the cry of grief. 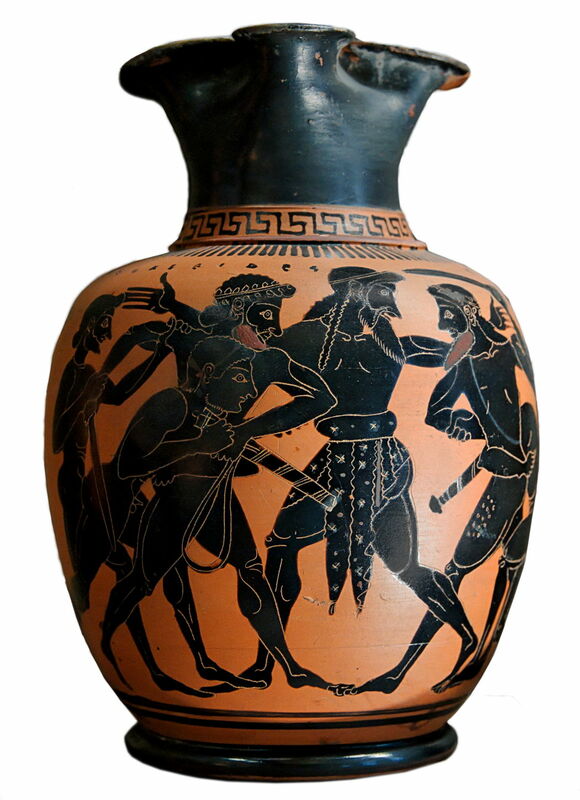 This story from the Trojan War was a popular theme in classical art, and appears in many fine vases. The Taleides Painter, Dispute between Ajax and Odysseus for Achilles’ Armour (c 520 BCE), Attic black-figure oinochoe, Kalos inscription, Musée du Louvre, Paris. Original image © Marie-Lan Nguyen, via Wikimedia Commons. This, created by the ‘Taleides Painter’ in about 520 BCE, shows the warriors being held apart as they vie for the arms and armour. Perhaps this type of confrontation did not fit well with more modern values, but I have only been able to find one painting which shows Ajax and Ulysses arguing their corners. Leonaert Bramer (1596–1674), The Quarrel between Ajax and Odysseus (c 1625-30), oil on copper, 30.5 × 40 cm, Museum Prinsenhof Delft, Delft, The Netherlands. Wikimedia Commons. 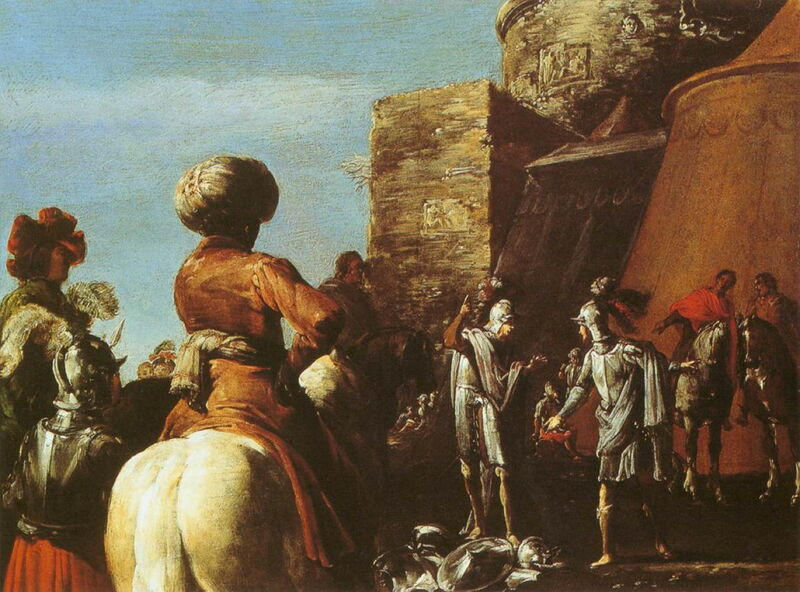 Leonaert Bramer’s small painting on copper of The Quarrel between Ajax and Odysseus was made between about 1625-30. The pair stand in their armour, next to tents pitched at the foot of Troy’s mighty walls. At their feet is the armour of Achilles, and all around them are Greek warriors, some in exotic dress to suggest more distant origins. 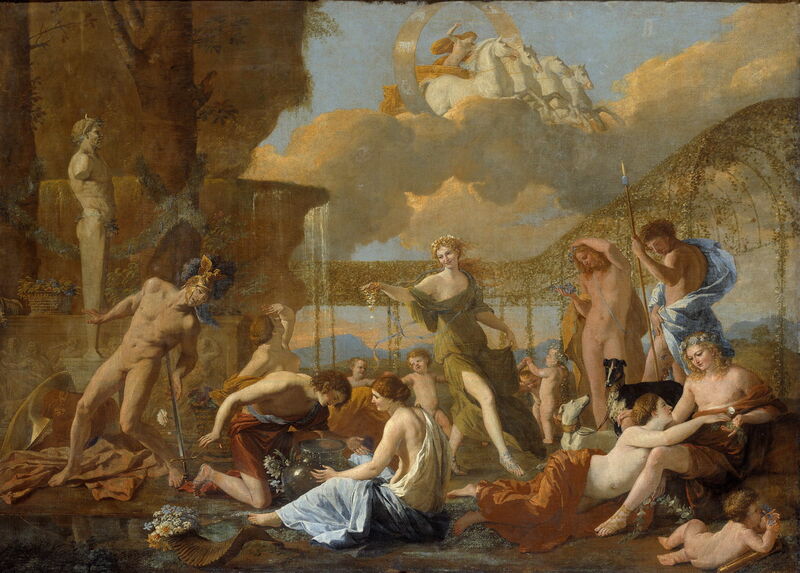 Just a year or two later, Ajax’s suicide appeared prominently in one of Nicolas Poussin’s greatest narrative paintings: The Empire of Flora. Nicolas Poussin (1594–1665) The Empire of Flora (1631), oil on canvas, 131 × 181 cm, Gemäldegalerie Alte Meister, Desden, Germany. Wikimedia Commons. Poussin painted this in early 1631 for someone named Valguarnera, who turned out to be a thief of uncut diamonds, whose prosecution in court enables its unusually precise dating. At that time it was simply known as Spring. It is set in a garden, with trees in the left background, a flower-laden system of pergolas, a large water feature, and dancing putti. 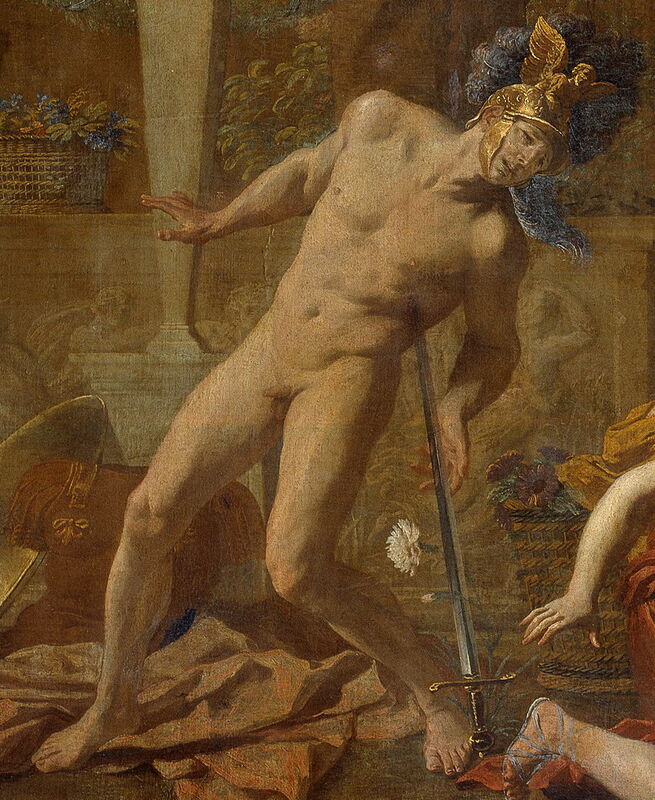 In this are a series of well-known characters, one of whom is Ajax, who is shown in the act of falling on his sword. Poussin has already used the purple hyacinth for the death of Hyacinthus, so here places under Ajax a white carnation which will shortly turn blood red. Only yesterday, in my article about the history paintings of Benjamin West, did I show one of his works which explains the importance of Achilles’ shield and armour. Here, Achilles’ mother Thetis has brought the arms and armour from Vulcan’s forge, to persuade her son to return to battle. He is still lamenting on the body of his friend Patroclus. There seems to be plenty of scope for narrative paintings of the dispute between Ajax and Ulysses, although Ovid’s account is firmly rooted in words rather than actions. Posted in General, Language, Life, Painting and tagged Bramer, Metamorphoses, myth, narrative, Ovid, painting, Poussin. Bookmark the permalink.